USPSA shooting is the most exciting way to use the skills you've learned at the range and apply them to a unique competition. Practical shooting includes many things you can't do at the range like shooing on the move, shooting through ports, and shooting steel targets. All these are done on a wide variety of stage descriptions. Some people are frightened by something so different. Read through this page and learn what to expect your first time out, and know that we are very willing to help new shooters! For information not covered here email your questions to info@lineadefuego.info. 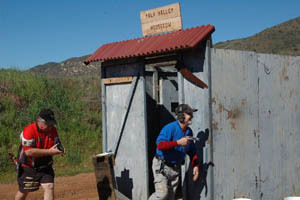 Pistol matches are held on the second and fourth Saturday of the month at the NCSA Pala range. 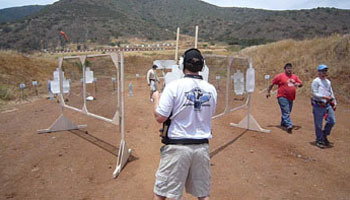 The 3-gun matches are held on the second Sunday of the month at the Pala range, and steel matches are held on the fifth Saturday of the month when one is available. Most courses of fire, or stages, run at 20-30 rounds, with some exceeding 30. Three magazines is the minimum, five or six would be better. If you only have 3 and a stage has more than 30 rounds, let your Range Officer know and we will find a way to accommodate you. Match sign ups begin at 8:15 and will continue until the match begins at 9:00. When you sign up, you will be given a score sheet. Many of the fields on the score sheet might not make sense to you if you have never shot a USPSA match before. Let the person conducting sign ups that this is your first USPSA match and they will help you fill out the sheet. 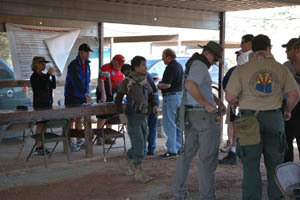 A shooters meeting will be held by the match director, who will go over the rules of the range and safety information. The match director will ask if there are any new shooters. Let us know that you are new - we love to see new people show up to our matches! A match usually consists of 6 stages of varying round counts. The stages are shot in squads, or a group of shooters, usually 8 to 10. You might be approached by one of our veteran members to join their squad, or you can approach the match director and have him or her assign you to a squad. Someone from your squad will gather all the score sheets. Shooters will read the course description and walk through the stage several times to learn where all the targets are and to figure out how to shoot the course of fire. Make ready! This means you are clear to take your pistol out of its holster and load the gun. The course may have a special starting position (for example, your gun might be on a table) or it may go back into your holster. You may take a sight picture and dry fire, or practice your draw, but make sure you do this BEFORE you load the gun. Are you ready? The range officer asks this to make sure you are prepared to start shooting. If you do not say anything, the range officer will assume you are ready. You may also say yes or nod your head to confirm you are ready. Standby! This lets everyone around you know that you are about to shoot, and it lets you know that the buzzer is about to go off. The buzzer will go off 2 to 5 seconds after the range officer calls standby. Once you hear the buzzer, you are ready to start shooting. Engage the targets, and remember, safety first. Do not place your finger on the trigger until you are ready to shoot. Never point your gun up range, always keep it pointed down range; many ranges, including ours, have a 180 degree rule; ask your range officer during a walk through if you are unsure about the 180). Remember to keep your finger out of the trigger guard while reloading or moving. Stop! Any Range Officer assigned to a stage may issue this command at any time during the course of fire. The competitor must immediately cease firing, stop moving and wait for further instructions from the Range Officer. If you are finished, unload and show clear! If you are done shooting, take your finger off the trigger and out of the trigger guard and drop the magazine. Then pull the slide back and let the range officer examine the chamber to confirm that the gun is unloaded. If you are shooting a revolver, pop out the cylinder and empty the remaining rounds, then let the Range Officer examine the cylinder to confirm it is empty. Once the Range Officer confirms your gun is empty, he will give the next command. If clear, hammer down and holster! This means you can now drop the slide into battery or if you are shooting a revolver, put the cylinder back into position. If you are shooting a revolver, you may now holster the gun. If you are shooting a semi-automatic pistol, you MUST dry fire the gun (no decocking allowed) to confirm the gun is empty. You may then holster. Range is clear! This lets the other shooters know that you are done shooting and that your gun is unloaded and secured back in the holster. After you are done shooting, the targets will be scored and taped so the course is ready for the next shooter. It is important that you help your squad tape targets, reset steel targets, and pick up brass. All these activities help keep the range clean and help the match run quickly and smoothly. There are many things you can do to make your first time out a success. Linea de Fuego is very dedicated to helping new shooters get in to this exciting sport. Remember, we ALL started where you did, and our club hopes to see you come and have a great time! Here are some great tips to help you have a good time! USPSA is one of the safest sports around because we follow stringent safety guidelines. If you accidentally discharge your firearm or break the 180 degree rule, you will be done for the day. This is why its important to take it slow your first time out and concentrate very carefully on what you are doing even though you might see some top shooters come out and blaze through a course of fire. Part of the enjoyment of this sport comes from shooting fast and moving, but it's important to have a strong safety foundation. The members of LdF all share a commitment to new shooters, and there is no such thing as a stupid question. We've all been a new shooter, so ask us a lot of questions! If a person doesn't know the answer, they will find someone who will. Many members are certified range officers and can give you valuable tips and information. You just need to ask for it. People may also ask you questions to get a sense of what level you are at with firearms to help you get adjusted. Don't forget your eye and ear protection. Pala can be hot in the summer; so bring water and sunscreen. Wear comfortable shoes, because matches generally involve running and being on your feet for the duration of the match. We welcome spectators. It's fine if you want to just observe your first time out, but of course we think you'll probably want to jump in and have fun shooting with us! Everybody has to start sometime, right? You'll have plenty of time to watch other shooters before you shoot to get used to how the sport works. If you do decide to just spectate, feel free to ask questions of the shooters. We can help you with anything you want to know, or at least direct you to someone on the range who can. Don't forget to bring hearing and eye protection even if your just coming to observe. USPSA has created a video to show you what action shooting is like. Its a must-watch for any new shooter who wants to know a little more about the sport. Action Shooting Podcast is run by a former LdF member, and has a great article on getting started in the production division. This guide aims at being comprehensive, but doesn't address everything. Fortunately, we're easy to reach! If you have any questions not covered here, do not hesitate to email us at info@lineadefuego.info. We'd be happy to answer any questions you have about USPSA and how to get started!